Composed by Wolfgang Amadeus Mozart (1756-1791). Leduc. Classical. CD. Alphonse Leduc #AL20857. 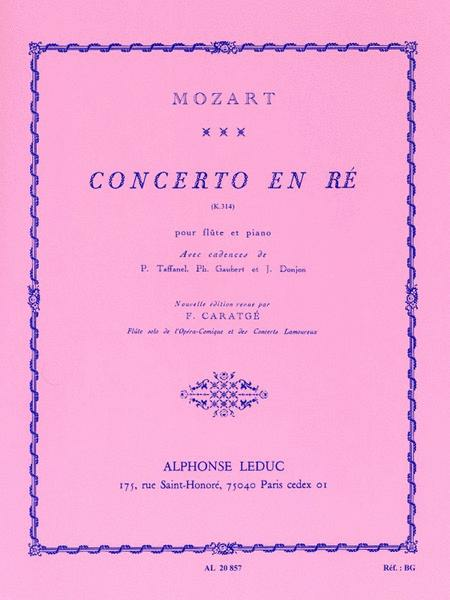 Published by Alphonse Leduc (HL.48181380). “Wolfgang Amadeus Mozart's (1756-1791) Flute Concerto in D is an adaptation of the original Oboe Concerto in C, which the composer reworked in 1778. The Concerto remains widely studied and performed on both instruments, making it one of the more important Concerti in the woodwind repertoire. Concerto in D is in three movements; 1. Allegro aperto, 2. Adagio non troppo, and 3. Rondo: Allegretto. The first and last movements are in the tonic key, whilst the second movement is in the subdominant key of G major. A Dutch flautist of the time, Ferdinand de Jean, commissioned Mozart for four Flute quartets and three Flute concerti. However, the composer, who famously disliked the Flute, only completed three quartets and one concerto. Instead of composing a second concerto, Mozart rearranged his Oboe Concerto, with substantial changes for it to fit with the Flute. 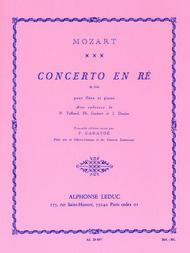 De Jean did not approve, yet the Concerto in D for Flute remains as popular to this day as the Concerto in C for Oboe.”.